BEIJING - Golf, considered to be a luxury sport played by China's new rich, is becoming more and more popular throughout the country. And along with the boom in the business has come a large number of golf courses built in violation of the law. One country club brought into question lies adjacent to the Stone Forest world heritage site in the Shilin Yi autonomous county, in Southwest China's Yunnan province. China Central Television (CCTV) reported on Saturday that the club has been accused of illegally using a large area of land for the construction of golf courses. The club's 4,050 hectares contain three beautifully manicured golf courses in the midst of one of the country's most famous karst landscapes. All of it was built after the government had put a halt to the construction of golf courses seven years ago, the report said. "We sent a stop-work order to the developers to urge them to stop the project in August 2010," Li Yibo, deputy chief of Shilin's bureau of land and resources, was quoted in the report as saying. "But the company didn't heed us." Wang Xiaojian, deputy general manager of Yuantong Investment Company, which initiated the golf club, had a different view of the matter. He said the project began in 2008 and had already been completed by the time the stop-work order arrived. "We had got an approval from the local government before beginning construction," Wang told CCTV. To Gao Yunhua, deputy director of the Stone Forest's tourist zone management committee, the construction of the new golf club was not illegal. It promised, Gao explained, to raise tax revenues and employ more people, according to the report. In response to the criticism, Duan Mingzong, an official at the county's development and reform commission, and Gao were dismissed from their duties and brought under investigation on Sunday, Xinhua News Agency reported. To protect the country's shrinking land resources, the central government imposed a ban in 2004 on the construction of new golf courses. Illegal courses, such as the one in Shilin, have become common ever since. The number of golf courses in China has more than tripled, going from 170 in 2004 to nearly 600 now, according to statistics from the golf education and research center at Beijing Forestry University. 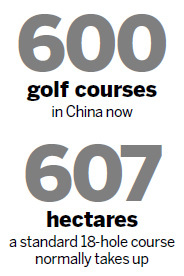 In Beijing alone, there are more than 170 golf courses and practice courts in operation. At least 70 of them are suspected to be illegally occupying arable lands, according to an earlier report by Southern Weekly. The report said the construction of golf courses has long been blamed for an excessive occupation of arable land; a standard 18-hole course normally takes up more than 607 hectares. Maintaining the courses is also known to require the use of large amounts of water. Experts said a course containing from 40 to 50 hectares needs at least 3,000 cubic meters of water every day. Industry insiders said that when most of the new golf courses were built, they were called country clubs, sports parks or greenbelts, and continued to run golf businesses even though they weren't licensed to do so. In response to the increasing demand for places to play golf in, the Ministry of Land and Resources has authorized Hainan province as the only province allowed to build golf courses, helping it pursue its goal of becoming an island resort. Li Jianqin, director of the law enforcement and supervision department of the Ministry of Land and Resources, warned last year that the existence of plans calling for the construction of golf courses in Hainan does not indicate that other provinces can ignore the ban. The senior land administrator also pledged previously this year to take tough measures to curb the use of land for illegal purposes, especially for the construction of luxurious villas and golf courses. About 11,000 hectares of arable land were used illegally in 2010.